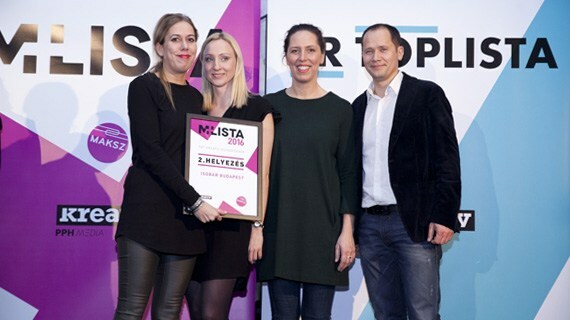 Isobar Budapest came in as #2 in the 2016 M+ List, the official index of creative excellence in advertising in Hungary prepared annually by the Association of Hungarian Communication Agencies (MAKSZ). The M+ List ranks agencies based on winner points earned through national and international competitons for a given year. The report for 2016 was published yesterday and our company demonstrated a fantastic come back by moving from #5 in 2015 to the prestigious second place in 2016. And if that wasn’t enough: three of our campaigns (Magyar Telekom – The Power of Sharing, Unicef – Unbeatable Trics and Hungarian Telekom – The Poster You Can Conduct) were recognized as three of the TOP 10 most successful campaigns in Hungary last year. Congratulations to the team!